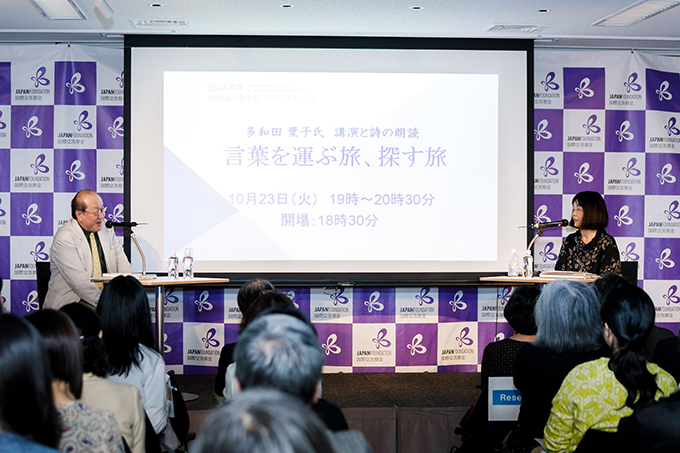 "Journey Carrying Words, Looking for Words," an event to celebrate Yoko Tawada's receiving the Japan Foundation Award, held on October 23, 2018. The moderator was Prof. Mitsuyoshi Numano (left) of the Graduate School of Humanities and Sociology, The University of Tokyo. I'd like to begin with the expression "grass pillow." This is the title of a novel by Natsume Sōseki, published in 1906, but it is also a "pillow word" used in association with travel. So "grass pillow" is a "pillow word," which makes two pillows. When I was in high school studying for university entrance exams, this seemed strange to me—why two pillows? But actually, when traveling in various countries, you sometimes find hotel rooms with not just two but as many as five, or even eight pillows lined up on the bed. Perhaps all these pillows are provided so that people can stick them under various parts of their bodies when they go to sleep—this one is for stiff shoulders, that one for back pain—or maybe the hotel manager is anticipating a multi-headed guest like the Indian god Nāga, but I myself become confused by multi-lingual sleep, with my head on this pillow here, or that one over there. There's a Japanese expression "you can't sleep on a strange pillow," but I am often a stranger to my pillow at home in Berlin, so often in fact that I owe it an apology—"sorry for not keeping in touch." For instance, when I counted the number of days I'd slept with my head on my own pillow during the first six months of 2018, it came to just 71 days. That's 71 out of 283 days, which means that three-fourths of the time I was traveling. But if I were asked what sort of pillows I slept on in Cologne, Mainz, Zurich, Leiden, Utrecht, Den Haag, Barcelona, New York, Los Angeles, Tokyo, Salamanca, Trento, Venice, Milan, Hamburg, Manila, Copenhagen, Lillehammer, Tübingen, Innsbruck, Victoria, Toronto, or any of the other places I stayed in, I'd have to admit that I don't remember any of them. There's something romantic about the word "travel," summoning up a special time when we leave our everyday lives behind, and come face-to-face with ourselves, or with nature. Considering the travels of Matsuo Basho makes me think that unless you dare to abandon the convenience of civilization, the luxury of taking food, clothing, and shelter for granted, your social position, and the support of friends and family to face sickness, poverty, and death, you can't really say you've traveled. That may be why I feel embarrassed to use the word "travel" for an ordinary trip to give a lecture or promote a newly published book; "change of place" seems more appropriate. I'm simply living my everyday life in a different place. I may wake up in a hotel, but I can write there just as I'd do at home, or be interviewed, and in the evening give a lecture or a reading where I meet all sorts of people. The same is true of my time on trains or in planes. I'm not really traveling, I'm just moving from place to place. The influence this sort of movement has on the mentality of contemporary writers is naturally quite different from the effect Basho's travels had on him. In the Japanese dictionary Kōjien, "travel" is defined as "the act of leaving the place where one lives and temporarily going to a different place." In the current age, with more and more refugees and people forced to go into exile, there are many who, though they have residence visas, live in Germany for years without knowing whether their stay will be temporary, or whether they will be there for the rest of their lives. Even if an application for a residence visa is refused the applicant is not required to leave immediately; nevertheless, these people cannot work, and with no idea when they will be deported, they must live in uncertainty for years. They are not travelers, yet they are not residents either. Referring to her own experiences, Tawada talks about travel. Returning to the Kōjien, I find the following supplementary explanation: "In ancient times 'travel' was not limited to going to a faraway place, but referred to all instances of leaving one's home." This is astonishing. Even leaving home for a bowl of ramen at the shop by the station would be considered "travel." A poem from the Man'yōshū is quoted as an illustration: "Food I would eat from a bowl at home/ on this grass-pillow-journey I place on an oak leaf." In other words, "travel" means putting your meals not in a bowl or on a plate as you would at home, but on a leaf. When you think of it, plates and bowls are among the things people are least likely to take with them while traveling. You'd take your eyeglasses, your computer, and the clothes you wear at home, but nobody takes their own bowl and set of chopsticks to a ramen shop. And yet a change in tableware can be far more dangerous than a change of pillows. In 1982, on my way to Germany, I got off in India. "Got off" may sound as if I went all the way to Germany by bus, but actually I took an Air India flight to Europe and stopped off in India, where I stayed for about a month, doing nothing in particular. I went to Delhi, Agra, Patna, and Bombay (Mumbai) by train. When the train stopped at a station, I'd open the window, and when men on the platform selling chai came around, I'd buy some, served in a rough clay teacup. The people around me threw their cups on the ground and broke them when they'd finished drinking, and when I asked why, someone told me that if a bad person picked up the cup you'd drunk from, he might use black magic later to cast a spell on you and make you sick. Ever since, I've felt slightly nervous after eating in a restaurant, or having coffee in a coffee shop. It seems possible that someone might use whatever traces I've left behind to influence me in some way. Now DNA can be extracted from saliva left on dishes or cups. In time, it might become possible to create my clone and manipulate her to commit crimes. Since I don't write science fiction, my imagination doesn't generally wander off in that direction. But I am always wondering what will happen to the words I speak and the traces I leave behind while I'm on the road, how they will affect the people on the receiving end, and whether or not I will someday, in some way, encounter something that has resulted from that contact. I think my trip to India in 1982, with just a rucksack on my back and no hotel reservations because the Internet didn't exist yet, was closer to travel, rather than simply moving from place to place. I had no particular aim. Having gotten a two-year position as a company trainee in Germany, I thought that with so many interesting countries between Japan and Germany it would be a waste not to stop off somewhere on my way to Europe; nevertheless, I had trouble deciding exactly where to stop. I was still puzzling over this when I had a dream about India, so I decided to go there. It would have been quite something if I'd dreamt of a white elephant, but my dream was much more mundane—just scenes of an everyday street corner in India. Traveling in India was a struggle every day: I got sick; I stayed in a room where the walls were covered with insects; I was surrounded by the rich aroma of spices I had never smelled before; I saw reams of cloth dyed in colors more vivid than I had never seen; I had countless mysterious conversations; I felt the beat of the tabla drum reverberate in my bones; in short, I was jolted and shaken until I no longer knew the difference between good and bad. To be truly shaken up—isn't that the real joy of travel? At the Jaipur Literature Festival 2016. Tawada is on the podium at the far left. Over the years, I have received help from the Japan Foundation many times. They have invited me to give lectures and readings in a wide variety of countries, and they have supported the translation of my work, allowing my words to travel. 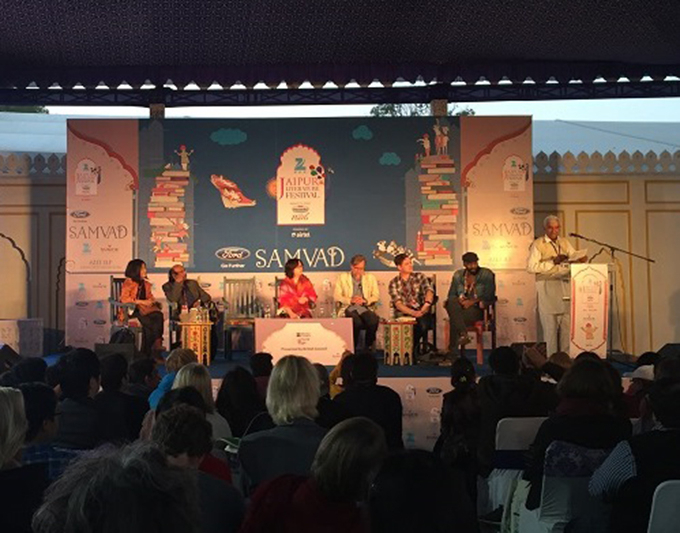 While the majority of my Japan Foundation-organized events have been in North America and Europe, when the foundation invited me to the Jaipur Literature Festival in 2016, I was deeply moved at the thought that I'd be returning to India for the first time since I'd stopped off there 34 years ago. Of course, this time was completely different: I was met at the airport, stayed in a very nice hotel, and the Indian food I had was safe and sanitary. Nevertheless, I once again experienced that sense of being shaken until I didn't know what was good or bad, which is the most valuable aspect of travel. First of all, although festivals of this kind are sometimes carefully planned, with a detailed schedule and order of events, in Jaipur I learned that you can have very exciting performances without planning, or practice, or giving much thought to the schedule. What you do need, though, is flexibility; you need the sense not to cling to the plan you've made, but to give up on it if it's not working and make a new one on the spot, and you mustn't fret if things don't go smoothly at first, for what's much more important are things like understanding the people in front of you—understanding them thoroughly, using all of your five senses. Born in Tokyo. Yoko Tawada graduated from Waseda University. In 1982, she went to Hamburg, Germany. She obtained MA from the University of Hamburg and PhD from the University of Zurich. 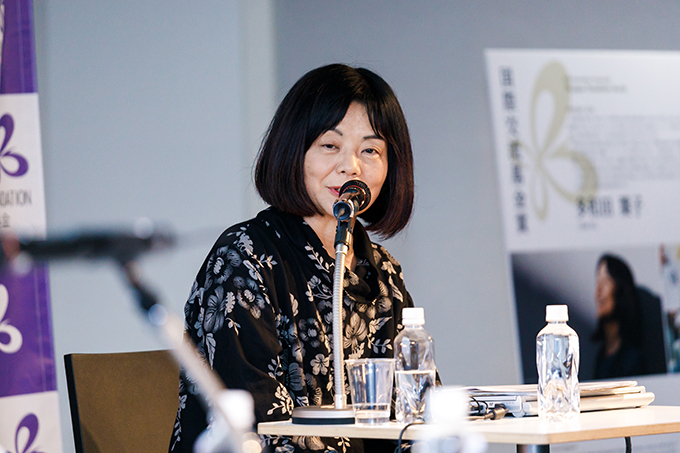 Tawada won the Akutagawa Prize for The Bridegroom was a Dog in 1993, won the Noma Bungei Prize for Memoirs of a Polar Bear in 2011, and the Yomiuri Literature Prize and the Ministry of Education Prize for Fine Arts (literature) for Kumo o tsukamu hanashi in 2013. 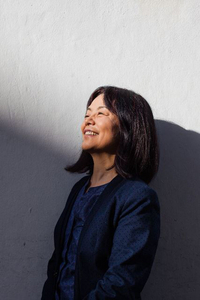 She writes in both German and Japanese; her works have been translated into many languages. Tawada is the recipient of internationally prestigious prizes, such as the Kleist Prize (2016) in Germany and the National Book Award (2018) in the U.S. for The Emissary.